JetBlue Airways will launch daily Mint service between its primary hub at New York JFK and San Diego International Airport on August 15, 2017. JetBlue Airways has decided to install 162 seats rather than the originally planned 165 seats in retrofitting each of its Airbus A320 jets with new cabin interiors. Each JetBlue A320 currently has 150 seats, so JetBlue’s A320 cabin refurbishment will see it add 12 more seats in each aircraft. From May 5, 2016, JetBlue Airways will operate two daily round-trips between Nashville International Airport and Boston Logan International Airport and one daily round-trip between Nashville and Fort Lauderdale Hollywood International Airport. JetBlue Airways will launch winter and early-spring seasonal service between Syracuse Hancock International Airport and Fort Lauderdale Hollywood International Airport on January 13. JetBlue Airways has begun selling tickets for its new Fort Lauderdale-Providenciales daily service, which the carrier will begin operating on November 19. 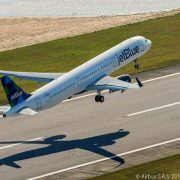 Subject to receiving the required government operating authority, JetBlue Airways will begin operating three-times-weekly round-trips on the New York JFK-Antigua route on November 5. Originally the airline announced, on May 4, that it would begin serving Antigua on November 7.